If there is one resort that I must rate at the top of my list of great hotels and have a desire to keep returning, it's this one ... the Four Seasons Resort. In fact, if you ask locals which is the best hotel in Langkawi, this would be the name taken almost by all unhesitatingly. So what's so special about this resort? Well if you are looking for a family friendly top class property which is also equally romantic, with unspoiled private beach and offering all pervasive serenity, then nothing can beat Four Seasons in Langkawi. This is a destination by itself. I have seldom found guests who stay in this resort venture out of the property to seek for anything new or different. The white powdery beach with so many little islands offshore, the tropical gardens, the vast sprawling landscape, all create an experience which you won't forget easily. The driver meets you at the airport who also doubles up as their trained staff offering you a cold towel and ice cold packaged water. It takes about 25 minutes to reach the resort. Once you go past the security at the main gate, the driveway finally leads down to the reception area. You will be seated at the Welcome Pavilion and offered a soothing welcome drink made with lemongrass... tastes like a light, smooth & chilled lemonade. The alfresco lounge with a slanted wooden roof and wooden floor overlooks a beautiful lake surrounded by bushy hedges and palms on both sides, and a gazebo at the other end. It's an amazing setting and complete with an antique boat. From here on, you can avail the battery operated cart to get around the property or walk. Some facilities like restaurants and accommodations are quite far and will require some energy if you decide to walk particularly on a hot summer day. Update December 2018: The resort has recently undergone major renovations under the supervision of the designer & architect Bill Bensley. 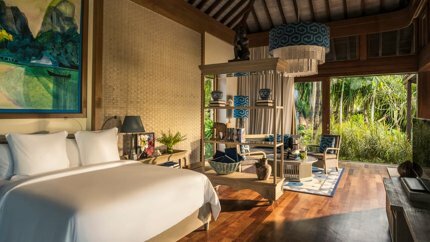 From an earthen tone that embraced and blended with the natural surroundings of lush rainforest, Andaman sea and ancient limestone cliffs, the color palette has also included vibrant blues in decor and furnishing to make the resort stand out. 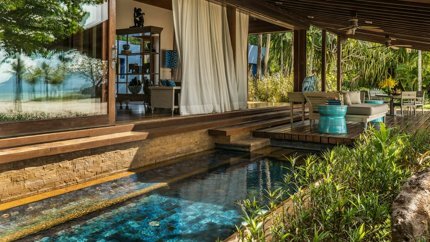 The resort has added three deluxe family beach villas with plunge pool, two 3-bedroom garden villas with pool, a floating jetty to facilitate water sports and mangrove tours etc. The pools, restaurants and the bar too have been renovated. Below you can see the updated descriptions and pictures. There are several types of accommodations in the resort. All units come with King size or two twin beds. In-room amenities include plasma TV, DVD players, iPod docking station, air-conditioner, phone, tea & coffee maker, mini bar, free wi-fi / wired internet connection points, writing desk, in-room safe, iron & board etc. Extra beds, day beds and additional pillows are provided on request. The most popular accommodations are the units in two-storey Malay-style Pavilions. There are 68 of them and each divided into four units, two in the ground floor and two in the upper floor. Some of them have nice sea views while the others are nestled in beautiful tropical gardens. The units in the upper floor are accessible by wooden staircase. All rooms have marbled bath with marbled bathtubs. The units have large verandas where you can relax on a day-bed or cushioned chairs and enjoy the ambience all around. Some of the new features includes revived teak floors, antique mirror inlays, touches of bold blues, original artwork etc. Rooms in all these pavilion units are spacious (68 sq.m), and have a king size bed and a rollaway bed. Each unit can accommodate three adults or 2 adults with a child. The Beach Villas are just steps away from the private beach. 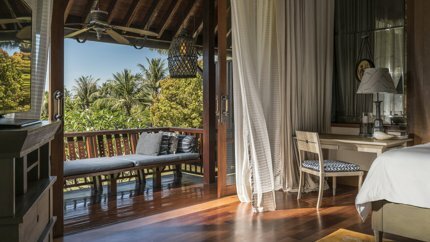 Each villa (220 sq.m) can accommodate three adults and has a private plunge pool, secluded outdoor rain shower, hammock etc. 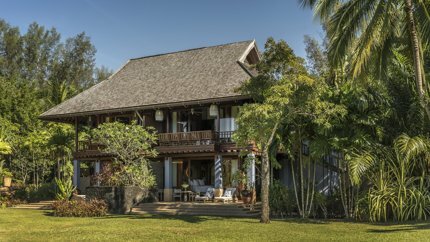 There are Family Beach Villas as well that have additional two queen beds accommodating up to 5 adults. Deluxe Family Beach Villas with plunge pool are the new additions (226 sq.m) and can accommodate 5 adults. Another new addition are the Family Garden Villas with pool (590 sq.m) each having three bedrooms and accommodating 8 adults. Perched in a seclude area are the Royal Villas (1,400 sq.m) with two bed rooms each and having their own private swimming pool and even a spa room. Each can accommodate up to 6 adults. These are ideal for families who like absolute privacy. If you have accompanying children (up to the age of 18), they can stay free in your room or villa. However there is a limit to maximum occupancy in a unit. When it comes to dining and wining, I seriously don't think there is any other hotel in the island which can beat the Four Seasons Resort. The Restaurant Ikan Ikan which in Malay means 'fish', serves authentic Malay cuisine. Overlooking the Andaman sea, it has several seating areas including an open air deck with teak wood floor and two-storey fish-scaled terracotta roof built in Malay architecture. It serves only dinner and offers nice selection of cocktails. One of our favorite dining places here is the Kelapa Grill. As the name suggests, this is an ideal place to have seafood grill and steaks. During lunch it serves lighter fares like pizzas prepared in wood fired ovens, stir fries etc. However, you can stroll across to the restaurant to take a table and view the spectacular sunset while enjoying a cocktail. And then order for a sumptuous dinner... it serves excellent grilled items like T-bones, rib eyes, fish fillets etc. Serai is another great restaurant located by the beach side. It means Lemongrass in Malay and serves authentic Italian cuisine. Breakfast is served in the ground floor while a cozy elegant dining room upstairs serves dinner. You can dine there al fresco as well. But one of our best experiences was to dine on the sand under the Rajasthani tent from India which was illuminated by traditional lanterns. Romantic setting can't go any further than this. One of the best bars in the island, The Rhu Bar with its Mediterranean ambience extends into the beach. With colored cushions on lavish wicker sofas, Turkish water pipes and Indian Mughal swings, and all that complimented with lights from hanging wall lamps is a royal ambience to be felt and relished. It offers a Japanese menu along with a wide range of cocktails and fine wine. The bar is open from 3pm till midnight. The private beach at Four Seasons Resort is an ideal venue in Langkawi for a romantic wedding by the beach. The usual beach venue is right in front of the Rhu Bar. The resort offers professional services for wedding ceremonies and reception. 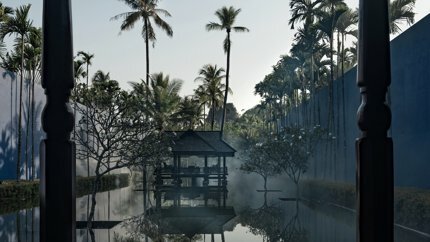 If there is one word for The Geo Spa ambience and massage treatments at Four Seasons, that would be to say mesmerizing. The all pervading serenity of the spa is unbelievable. There are wooden gazebos and treatment rooms around a central pool, and one right at the middle of the pool. You can sit by the side of the water and gaze at the marvelous rocky wall formations and take your massage or one of several other treatments that are done using top class natural ingredients which are mostly obtained from the rainforest. There is a separate Adult Pool and also a Family Pool. The adult pool has cabanas for couples needing more privacy. The family pool overlooks the private beach and the ocean. The resort offers sunglass cleaning services, suntan lotion, cool towels, iced water, sliced fresh fruits etc by the pool side. There is also a pool side cafe next to the Family pool serving nice snacks. There is a Tennis court with flood lights where you can play both at day time and at night. Private lessons are offered for a fee. A well equipped fitness center is open 24 hours and overlooks a lush freen landscape. Daily yoga sessions are offered by the resort. The resort offers daily cycling excursions to the local villages and paddy fields. On Friday evening, a cycling excursion takes place to the local night market. You can also engage in beach volleyball, beach tennis, beach football etc. A range of non-motorized water sport activities are offered from the resort's waterside pavilion like snorkeling, kayaking, standup paddle boarding, windsurfing, sailing etc. The resort also organizes a range of tours & other external activities including Mangroves & Geopark boat tour, nature tours, bird watching, golfing, diving, fishing, helicopter ride, sailing & cruising etc. If you are planning for several nights at the resort, take some time out for one of these great tours. There is a range of kids programs offered by Four Seasons (the Children's Center is located next to Kelapa Grill). The programs include drawing & coloring, games, kite making, singing, beach activities, yoga, weaving, puzzles, garden tour and lot more. Note that Four Seasons Resort is at the northern coastline of Langkawi and relatively in an isolated place. You won't find anything outside the resort premises. The resort can organize a taxi (reserved by the hour) should you like to get around the island on your own. Four Seasons Resort is located in Tanjung Rhu area at the northern coastline of Langkawi. It's about 20 kms (12 miles) from the airport and takes 25 minutes drive to reach.